A longtime Napa summer camp that offers traditional camping activities like archery, boating and horseback riding for the blind and visually impaired, reopened this summer despite heavy damage inflicted by last Fall’s Nuns Fire. Joe Rosato Jr. reports. A longtime Napa summer camp that offers traditional camping activities like archery, boating and horseback riding for the blind and visually impaired, reopened this summer despite heavy damage inflicted by last Fall’s Nuns Fire. The Enchanted Hills Camp, operated by Lighthouse for the Blind and Visually Impaired, lost 29 of its 58 structures in the fire including redwood cabins dating back to the 1950s, the stage for its outdoor amphitheater, a tractor barn and the staff house. "One forester explained to me it was just like a nuclear bomb went off here," said facility manager Donny Lay walking among a grove of blackened trees where the cabins once stood. 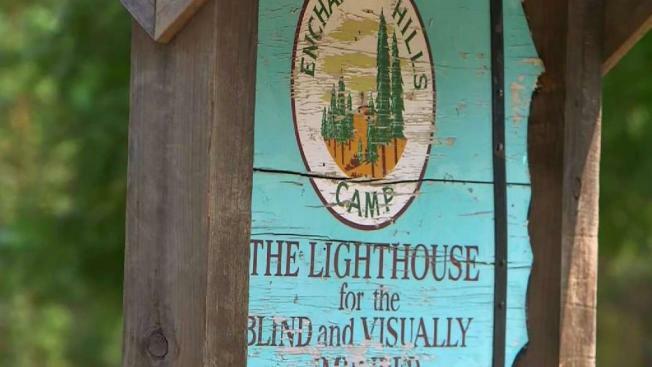 The Enchanted Hills Camp run by Lighthouse for the Blind, has brought camping experiences to the blind and visually impaired since the 1950s. The devastation inflicted in early October came after camp had ended — remaining staff members were able to safely evacuate from Mount Veeder. But what organizers returned to was a heartbreaking scene — which left them wondering about the prospect of holding camp this current summer. "In my head I was like I don’t know how you’re possibly going to get this thing happening," said Lawrence Brown III, co-director of the summer music camp. After clearing massive amounts of debris and erecting temporary tent cabins, camp indeed went on this summer with fewer amenities and campers. Gone were the redwood bridges that spanned the creeks and ten cabins that housed women campers. A redwood grove sign was the only survivor of the fire at the lower portion of Enchanted Hills Camp in Napa. Firefighters battling the blaze left a note on it saying ‘we’re sorry we weren’t able to save your cabins, but we saved your sign. In their place, large piles of logs from the felled trees. But the flames spared the property’s oldest buildings and were ultimately unable to diminish the camp’s spirit. "The great thing is we determined we were going to have camp this year and we did," Lay said. "And that was very exciting for us — we’re going to call it a big victory." On a recent day, a dozen campers gathered in the camp’s music room to learn choral songs for an upcoming performance aimed at raising money for the rebuilding. A pair of service dogs napped on the floor as the choir refined the melody of a song. Julie Cabrera tilted back her head and lent her voice to the hymn-like music sung in Latin. Campers at Enchanted Hills Camp rehearse for a choral performance to raise money to rebuild the fire damaged camp. "Much like blindness, we get faced with a lot of things that are unfortunate,"Cabrera said of the camp. "But we keep going, we keep moving forward and we keep having fun while doing it." The camp has a long tradition of bringing regular camping activities to the blind and visually impaired. Campers ride horses, walk the trails and even shoot arrows at targets that are marked with sound. Camper-turned-instructor Masceo Williams said the camp gave him a new confidence to deal with his visual impairment. "I never used a cane until I came here. Now I use a cane in the real world," Williams said. "It helps me — it's a tool — I didn’t know that it was a tool." Lighthouse for the Blind is raising funds to rebuild the camp with a five-year timeline for the full rebuilding, Lay said. Many of the cabins destroyed in the fire were already marked for eventual replacement. Even with fewer amenities, most visitors said the true nature of camp seemed already fully restored. "There are a couple of things that are not what they once were," Williams said, "but the bottom line is camp is still here."